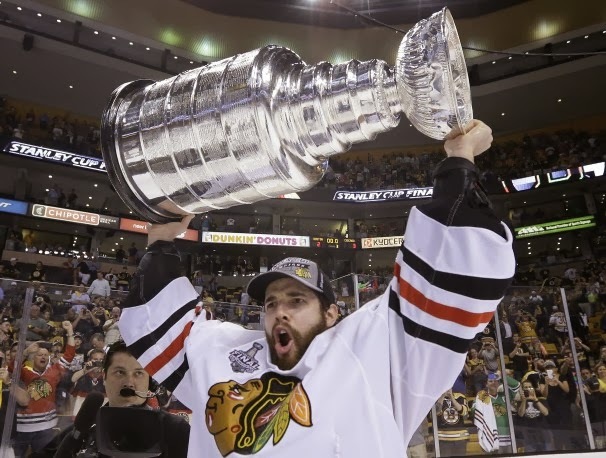 Today the Bruins will be in Chicago to play the team that beat them in the Stanley Cup Finals. It'll be a sad day and a day of pain for the Bruins and Bruins fans. Thank goodness though we lost to a classy team and fan base like Chicago instead of Vancouver. Can you imagine if we lost to them? So, to no surprise whatsoever, the Chicago Blackhawks are a wicked pissah hockey team. They have an amazing offense, a great defense, and good goal tending. A combination that has earned them a 31-8-11 record. Just a bit better than the Bruins 30-15-2 record. The season after the Bruins beat the Canucks in the 2011 Stanley Cup, the Canucks, with Loungo on the bench, came out and beat the Bruins in a heated game. The Bruins can do that too but it depends on how the team plays. 1) You Can Go With This Or You Can Go With That: The Bruins can come out and play this game two different ways. They can either come out playing hard looking for revenge or they can come out and be struck with emotions that make them play sloppy and slow. If the Bruins don't come out and play the game the first way, then its going to be impossible to beat the Blackhawks. 2) Tuukka Time: It'd be nice to see Tuukka have a great game tonight and snap out of the cold streak he has been in. Tuukka seemed like a Vezina candidate towards the beginning of the season but he has cooled off. With the Olympics approaching though, Tuukka's mind may be else where.